With the common name of White Paper Daisy or White Everlasting Daisy, Coronidium elatum Syn. Helichrysum elatum is an easy care free flowering plant. One of a number of plants with similar common names this species is short lived especially in cooler climates. It will self seed, and it it easy to grow from cuttings. Grown for the masses if white flowers that appear in spring to summer, it attracts bees and birds to the garden. Some of the named cultivars such as ‘Sunny Side Up’ are lower growing than the species. Although this is a tall growing plant it is usually pruned back to around 1 metre in cultivation. It will flower in part shade and this makes it useful for planting beneath taller trees and shrubs. Choose a well drained soil and a position in at least good morning sun. Plant and water in with a liquid seaweed fertiliser. Usually from seed or from cuttings. 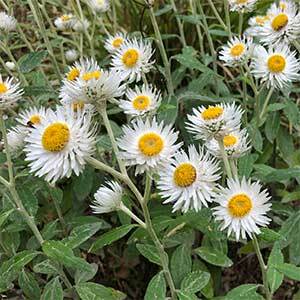 Common Name – White Paper Daisy or White Everlasting Daisy. Soil Humus rich and well drained. Flowers – White and daisy like. Foliage – Mid green, lanceolate in shape and around 8 – 10 kms long.